Named for a famous group of Native American tribes, Chippewa Men's 20075 Brown 10 Inch Chocolate Apache Pull-On American-Made Cowboy Boots are just what you need if you want to play Cowboys and Indians. The lace-free, 10-inch design has the rugged look of John Wayn ... (see full details) (see specifications) #CHP20075. Named for a famous group of Native American tribes, Chippewa Men's 20075 Brown 10 Inch Chocolate Apache Pull-On American-Made Cowboy Boots are just what you need if you want to play Cowboys and Indians. The lace-free, 10-inch design has the rugged look of John Wayne's favorite footwear, but all the safety and strength you need to protect your feet on the job. Made with chocolate-brown Apache leather, these smooth cowboy boots are easy to clean. The flexible leather of the pull-on boots surrounds feet in pliable strength, protecting every step. Drill vamp lining in the shafts of the men's boots surround your legs and ankles in soft fabric. The 5 iron Texon insoles are made to move comfortably with feet, allowing you to move naturally through each step in the USA-made boots. The Stockbridge Vibram outsoles are slip-resistant to keep all those steps firm. Oil-resistance protects the tread from wearing, especially against corrosive chemical agents. With 4 iron midsoles, your feet will have all the support they need in this Chippewa footwear. Give your inner rancher the safety and comfort he deserves with these stylish pull-ons. 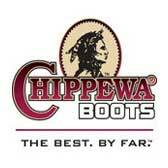 Chippewa Men's 20075 Pull-On Cowboy Brown Boots were made in the USA.
. When I got my Chippewa 10" Cow Boy 20075 Boots, lo and behold, they fit perfectly. They are made of a beautiful, durable leather and are almost too nice to wear. It's what I have come to expect from Chippewa. I am very happy with the boots. They just seem like a thicker, better quality leather, with better workmanship, than the other boots I own. I didn't realize that these were made in America until after, and I would bet that has a lot to do with it! I am a BIG believer in the saying "you get what you pay for." 27 out of 29 people found this product review helpful. These boots are the way boots should be made. Great quality, craftmanship, and made in the USA. What more could you ask for! The Chippewa Boots I purchased fit nice and break in really well. It's easy to walk with the orthotic insoles. Although the insoles are thin, they're better better than most other boots I've purchased. I like the fact the boots are made in the USA as well. I won't buy boots made in other countries, so this purchase worked very well. I highly recommend these boots. I purchased these boots after buying a similar pair of Chippewas with steel toes that were for work, they also were very comfortable. I really like the look and feel of these boots, I highly recommend them. Shipping was prompt and Working Person's Store will be my go to site for future purchases. Chippewa Boots: Men's USA-Made 20075 Brown 10 Inch Cowboy Work Boots is being added to your cart.